This is my third year making violet syrup, and last week I had to dig deep to find the energy to do it. I was upstate for just a tiny bit of time—less than 36 hours. It was a quick roundtrip to take measurements for some furniture I need to buy before we move back. We arrived under the cover of night and rain, and I hadn’t expected to do anything outdoor-related since the forecast was rain the whole weekend. When I woke the following morning, though, I blinked twice, as a sliver of sunshine peeked through my bedroom windows. It was the perfect prescription for prying my tired bones from bed. I splashed some water on my face, brushed my teeth, and threw on some jeans and a t-shirt to inspect the violet situation. On my last visit, four weeks earlier, the buds were just starting to sprout across the yard. I was fully expecting them to have bloomed, or withered away from the erratic temperatures we’ve had. To my delight, there they were, dots of purple with a few flecks of white, wild violets all around me. For a split second I contemplated passing on them this year. While making the syrup is incredibly easy, collecting the violets is a bit laborious. My knees do not like all the squats required to harvest them. I knew I would regret it if I’d let the moment pass me by. And a moment it is. Once my neighbor comes to mow the lawn that first hefty yield of violets are gone, and so is the season, at least in my yard that’s been the case since I’ve owned my house. I decided making violet syrup would be top priority. Everything else could wait, especially taking measurements. About an hour later, I had enough to make a small infusion, basically a violet tea, which is the first step in making violet syrup. I first started making it based on my friend Jen’s recipe, but time has taught me a few tips (see this post for more notes). This year I let the tea steep 48 hours, twice the time as in previous years. The extra steep was due to a busy schedule, and having to drive back to Maryland. I figured it couldn’t harm the resulting syrup, and would likely just make for a more pronounced violet extract. I’d also shared video of the harvesting and tea making process on snapchat. I decided to follow up with a live demo of making the the syrup once I got back to Maryland. And oh, how excited I was to share it with you. Guess what happened? Somewhere along the line, my camera must’ve decided to go on strike because when I went to download My Story, a feature in snapchat that allows you to save your videos for up to 24 hours, there was a segment missing! Regardless, I think this Snapchat Recap is still quite useful. 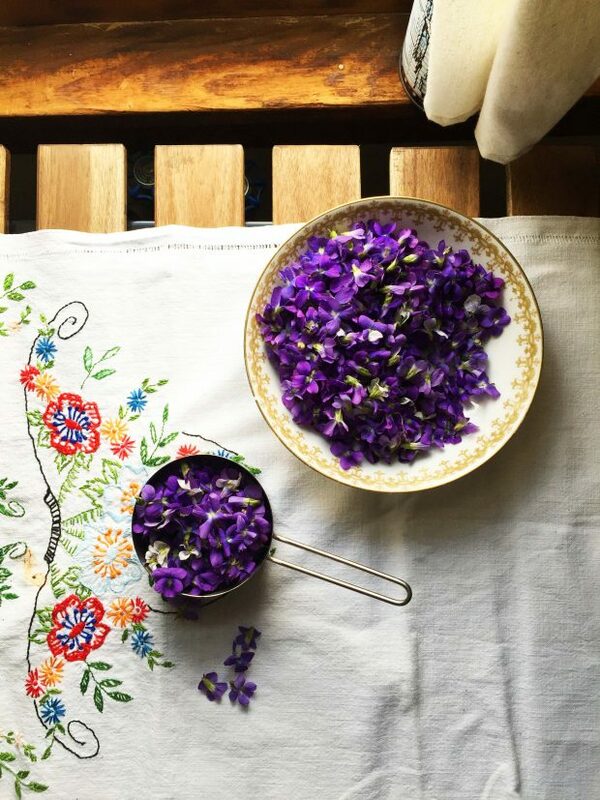 So, if you’ve been curious what to do with all those violets on your lawn, this homemade violet syrup is a wonderful weekend project. In the past, my girls have helped collect them. This year I couldn’t wrangle them outside, but it was a soothing way (creaky knees aside), to spend a sunny afternoon, and I can reap the rewards of my work for months to come. 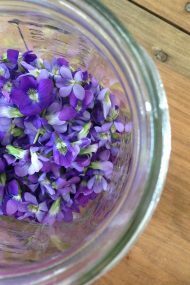 Add the violets to a heat-proof, glass jar. Pour the boiling water on top. Give the jar a few swirls to make sure the violets are submerged completely in the water. Screw the lid onto the jar, and let the tea steep for at least 24 hours, as if you were making tea (I let this batch steep for 48 hours). You can store the violet tea at room temperature, or in the fridge, once cooled, if you prefer. To make the syrup, place a fine strainer over a small-medium sized pot. Pour the infusion through the strainer, using a rubber spatula to press all of the water from the violets. Discard the flower solids. Add the sugar to the pot, and stir well to blend. Place the pot over a medium-low flame. Cook, stirring occasionally, until the sugar is completely dissolved, but without the syrup coming to a rolling boil. It should take 3 to 4 minutes. The syrup will turn a muddled greyish blue color. Don’t worry—this is normal. 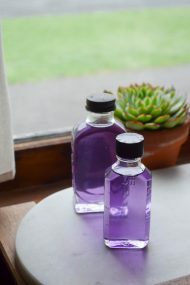 To return it to a vibrant violet color (more purple than deep blue it was in the tea phase), squeeze a few drops of fresh lemon juice into the syrup. 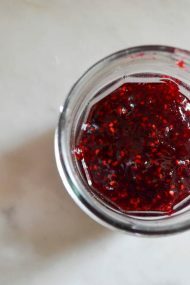 Pour the syrup into heat-proof, glass jars, and let cool completely before sealing closed with a lid. The cooled syrup can be stored in the fridge for up to 1 year (although I tend to use mine up before then!). Due to some events in our life, we had to sell our house and move to a condo. We hope to one day buy a house again. Your country home is like my ideal home. Small house – large yard – because my heart is always in the garden. I hope one day I will be harvesting violets from my own yard. This post brought back wonderful memories of picking wild violets with my Grandma when I was very young. 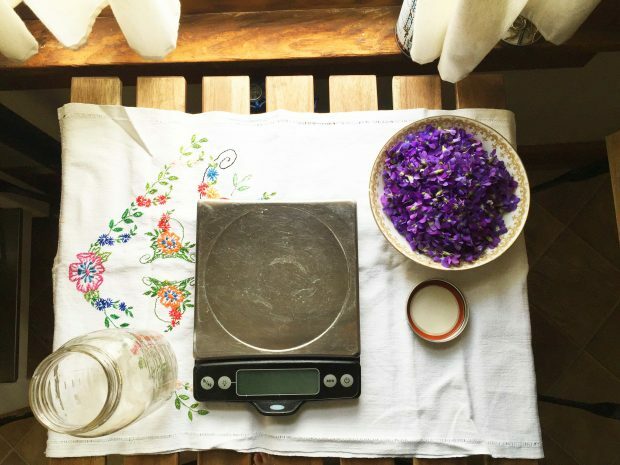 She would help me to press our harvest against a thick piece of glass to make ‘perfume.’ It took many violets, and a good bit of muscle, to result in a single drop of scented liquid – but the memories of time spent with my Grandma come easily to me. 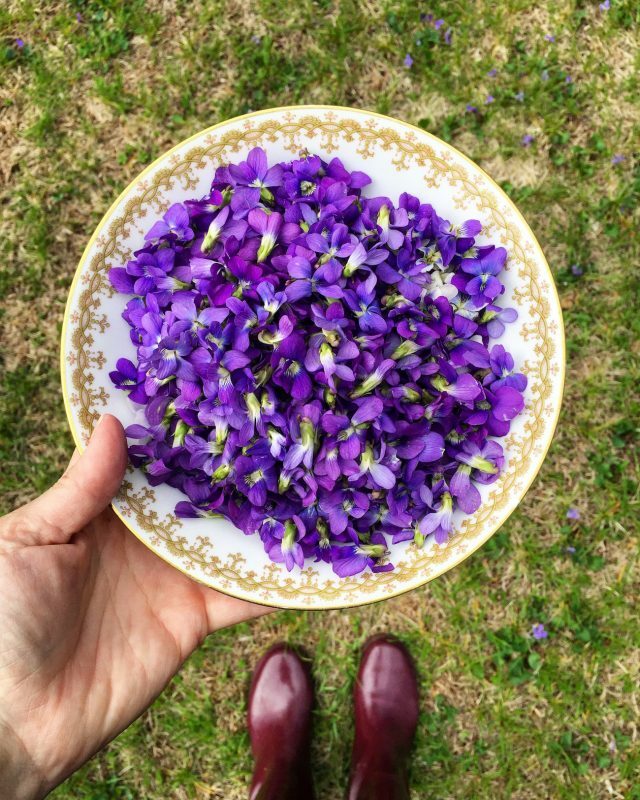 I have picked my wild violets and am excitedly preparing to make my violet syrup with your recipe. How do you use it?